I've been an avid PIAA Xtreme White Halogen H4 admirer for over a decade. I'm not interested in external, add-on lighting and haven't been interested in LED's-in-halo reflector lighting, until now. A friend has recommended that I demo the PATHFINDER 4000LM LED H4's, being that I'm a PIAA fan. He claims that LED technology has come a long way for halogen-based reflectors since 2016. The Pathfinder 4000LM has no external driver and no fan. It does have a cast-aluminum heat-sink. It comes with the removable H4 base that mounts into the reflector housing and retained by the oem spring-retainer. No modification to the rubber boot is required. Install H4 base into the reflector followed by the rubber boot, followed by bulb, through the boot, into the base, and rotate 90deg. to lock and plug-in. It's typical of other LED bulb installs but no external driver and, what appears to be, a modest heat-sink. I've never heard of Pathfinder before. It's carried through WPS so it's been around for 2018, anyway. $145.00 mfr# kwledkt for two H4's and two T10 bulbs, all from Pathfinder. This "kit" has different H4's with external drivers. Has anyone heard of Pathfinder? Pathefinder LEDs with Switchback signals and LED spotlights. Those always look impressive in pic's, for sure! Definitely white! Are your H4 LED's the 4000LM's or the external drivers? Have them in my bike, another rider I know has them In his bike,they are very bright even in the day time! I just installed two H4 LED lamps in my C14 @ 12,000 lumens each bulb. (24,000 lumens total) Dam they are bright.. $32 for the pair. H4's are shipped and due here Friday. One never had a problem with h4 led headlights. I’ve been running them for years in 6 bikes now. I think the eBay ones are way brighter then that and only $20. Stock bulbs are about 800 lumen. These days you can get 10,000 lumen or more with leds. I also run2 of the 3 bulb led flood lights full time. Those will fail. Mainly because the wires corrode and break loose. EBAY has dozens of H4 LED's for $3.00 each. EBAY Pathfinders are $50+. That's a huge spread! If you look at various LED claims, the Lumen claims are all over the board. To me; more important than brightness is light pattern and how well they illuminate the things beside and down the road. ie; Do things "stand out"..
Haven't heard from them in a time. That's what I'm hearing and that's what I'm after, for sure! How long have they been installed? ie; Do things stand out..
Oh I remember the COG Evitec thread a couple of years back. Can't even find Evitec LED's today. Throwing that white light forward, past halogen territory, is still rare in LED-into-halogen reflectors. It does need to be both, forward and sides, doesn't it? Gotta hand it to HD for some impressive LED's on their cruisers. Lots of them up here during the season and they are unmistakably bright. $500 per sealed beam LED, bright. They are impressive. I don't do nights because of deer and elk. I have enough problems with the daylight tourist. I found Headlight Revolution a while back on Youtube. This video talks about what to look for in an LED bulb. https://www.youtube.com/watch?v=DeaDrH0gXZk They are trying to sell their (pricey) products of course but the info is valid for what you find on Amazon & ebay. Basically, very thin where the LEDs are with them located very close to a halogens coils location to get the proper light pattern. Hope this helps in your hunt for a good replacement. I think they add up both lights for the lumen or watts if you prefer. Here is a good example. $12 for 2. 1400 watts! I believe if you’ve been hit from an old lady who says she never saw you, you get to blind the entire world on the road. 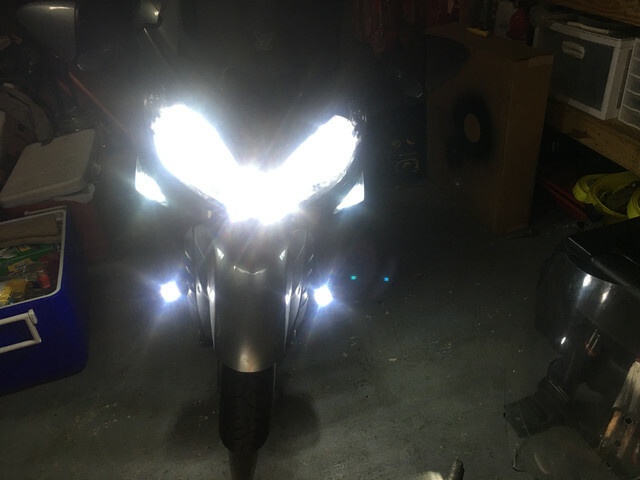 I have only had mine in a few weeks and only ridden once at night, the other guy i was riding with was behind me with his bright lights on in daylight, very noticable! That ad is a classic example of inaccurate info being published. There's a lot of confusion (or outright dishonesty) in seller listings for lumens and wattage (often not even listed). A 700 watt bulb would fry my C10. It is frustrating trying to decipher info in ads. Makes it hard to compare. and electrical consumption with no additional mod's or wiring. It's the plug-and-play that I like. JDSCO, look at your Pathfinders and these. I haven't looked part for part, line for line, but they all seem to be the same lights. These are for 70$ less? I also found the same design lights under 2 other names. If their not exactly the same I suspect all were made by the same manufacturer. NOTE: This one claims; 1620 Watts, and 243,000 Lumen LOL!!! I've heard from two GW owners who've purchased inexpensive led's. Their led's only lasted 1 year. I'm one of those that sang the praises of Evitek LEDs. I still have them on my bike, and I still love them. The cutoff is not quite as sharp as with the Halogens, but very close. As for light on the sides, I think as good or better than Halogens. If you read my thread of a couple of years ago, I'm convinced that they saved me from a hard collision with a deer (it was a very slow collision because I saw it contrasting against the green brush and had time to slow - lots!). I do believe that Evitek is a gonner. Glad to learn that there are LEDs out there that are high quality... just in case mine fail. That's good info Jim. What is snow?? NOTE: I wasn't dissing your lights. Just noticed the similarity. Suspect same manufacturer of the lights. The Pathfinders may have different/better LED's?? I noticed that the ones you have include a deflector plate to keep from blinding other drivers. Do you notice that in the light distribution?? Jorge, are the Evitek's 2 sided or 3? I have a set of inexpensive light that someone said worked well for them. These are 3 sided.. If you read my thread of a couple of years ago, I'm convinced that they saved me from a hard collision with a deer (it was a very slow collision because I saw it contrasting against the green brush and had time to slow - lots!). I had saved the Evitek H4 on Amazon in 2017 but I cannot find it now. It's good to hear you've hit the two-year mark with them. PIAA's are an average two year halogen. I have a propensity toward doing things that require "no snow" and "no deer"